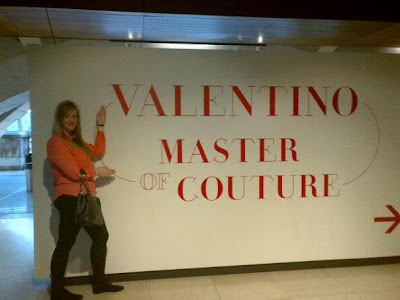 On the 11th January 2013, i went to visit the Valentino 'Master Of Couture' Exhibition at Somerset House with my mum, as she had come down to London to visit me. “Valentino: Master of Couture” will be a glamorous exhibition focusing exclusively on haute couture created by the legendary Italian designer. With a 50-year career starting in the late 1950's this exhibition will showcase over 130 hand-crafted designs worn by icons such as Jackie Kennedy Onassis, Grace Kelly, Sophia Loren and Gwyneth Paltrow. 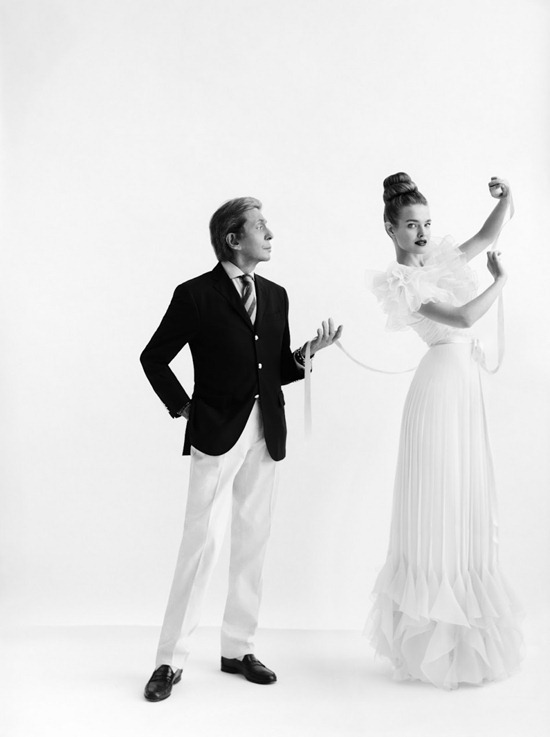 A prophetic designer and creator of exquisite, beautiful clothes, this is Valentino as he has never been seen before. Featuring dresses from the couture catwalk and red carpet, as well as designs commissioned by private clients, the exhibition will bring together a comprehensive collection of couture, much of which has never been seen outside the Valentino atelier. 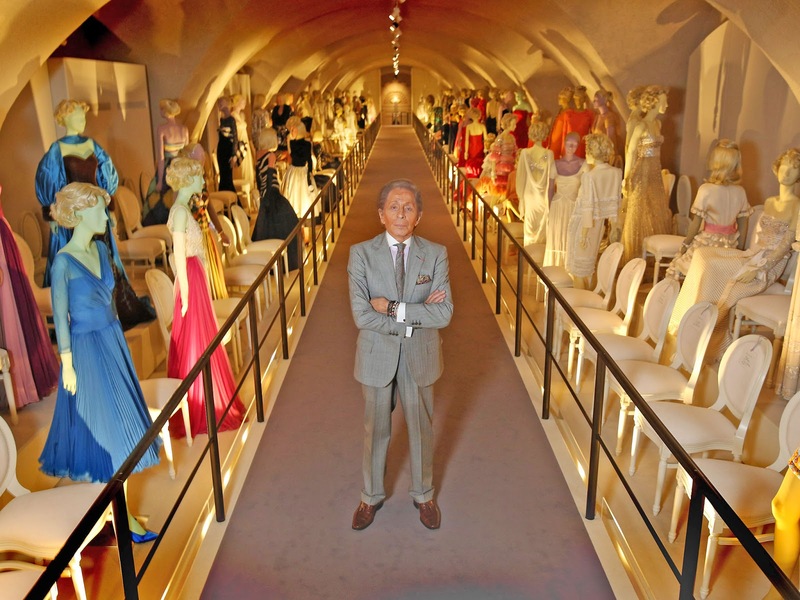 Visitors will be able to sneak a peek behind the closed doors of Valentino’s world and even experience the thrill of walking the runway. 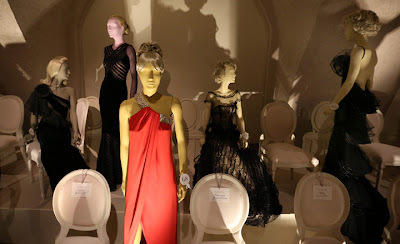 I was so excited to go and see this exhibition, as i absolutely love Valentino as a designer and especially like his famous red carpet dresses. The exhibition is split into three rooms. 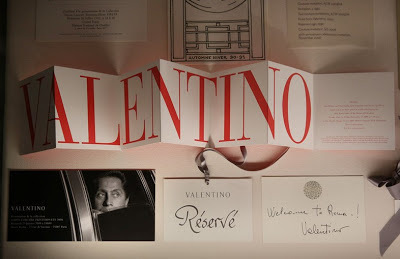 The first room starts with a brief history of the brand and how it has evolved, highlighting key moments, events and dates that Valentino has had throughout 50 years. 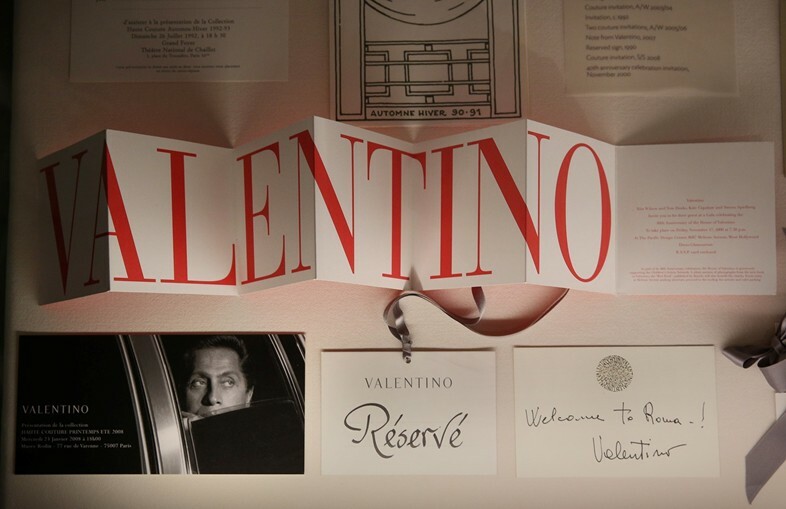 Vintage press cuttings sit alongside show memorabilia and hand written cards to Valentino himself from people such as Anna Wintour and Jackie Kennedy Onassis along with many more. The second room was my favourite. 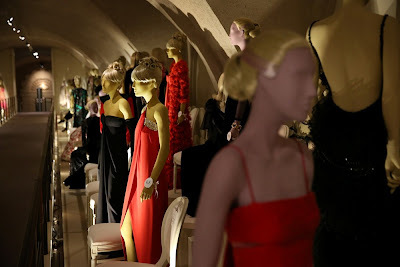 It was a long runway with chairs placed on both sides of the catwalk along with mannequins displaying over 130 of Valentino's haute couture designs. 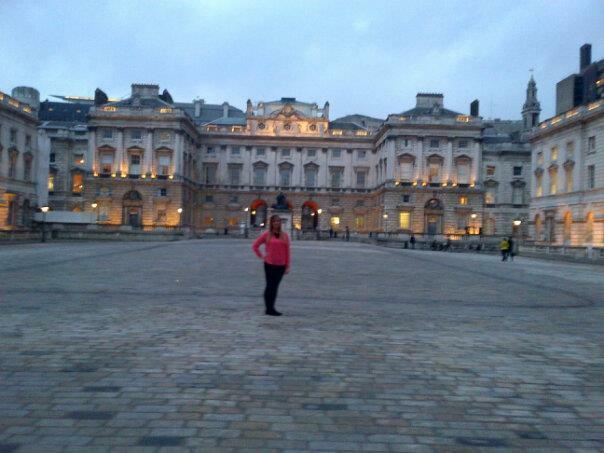 It was breathtaking. It was such a once in a life time opportunity to get so close to such amazingly, hand crafted couture designs, some which have never been seen before. 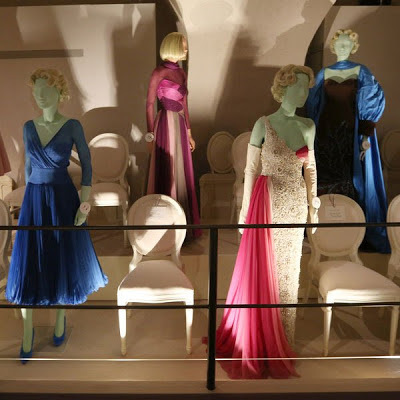 All of the designs were so beautifully designed and exquisitely made. 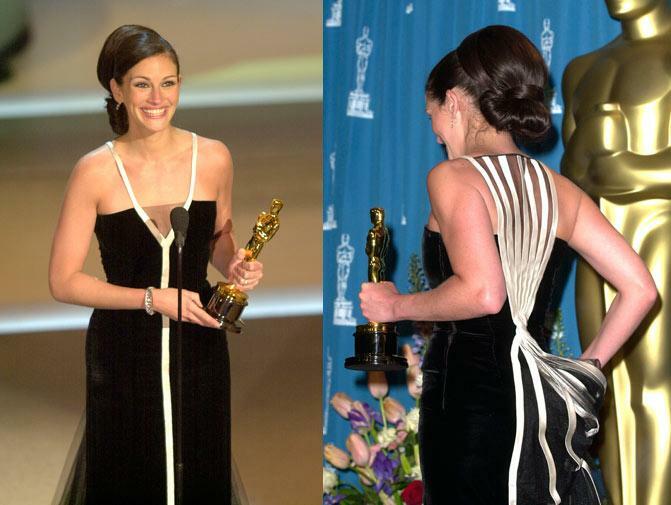 This dress which was featured on one of the mannequins was the dress designed for Julia Roberts when she won her Oscar. 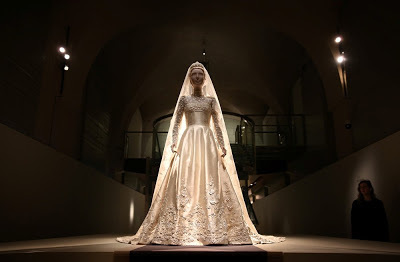 The third and last room contained a wedding dress designed for Marie-Chantal Miller to marry Prince Pavlos of Greece in London, July 1955. 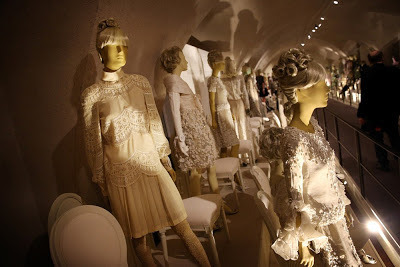 It took 25 seamstresses 4 months to complete the dress using 12 different kinds of lace. 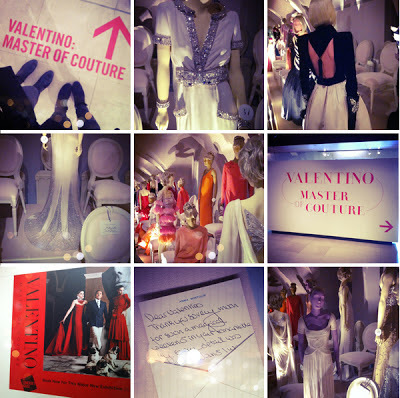 The Valentino atelier also made 61 further outfits for the occasion. 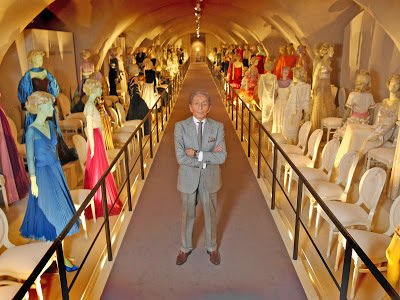 This room also contained a mini cinema room showing a video of Valentino's designs and another section of the room showed examples of some of the techniques used to create Valentino's designs with videos showing how the techniques are produced. 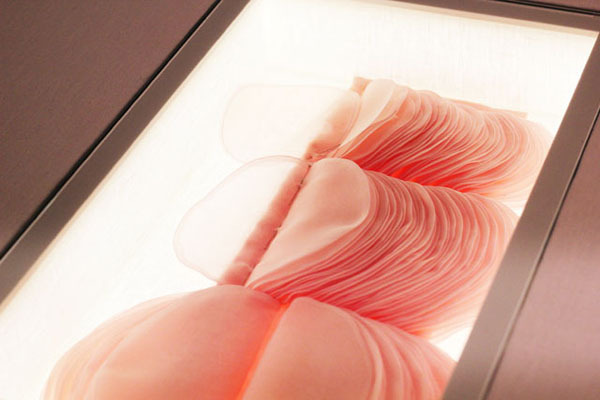 Pagine technique - Disks of organza piled to create a page effect, a technique unique to the Valentino atelier. 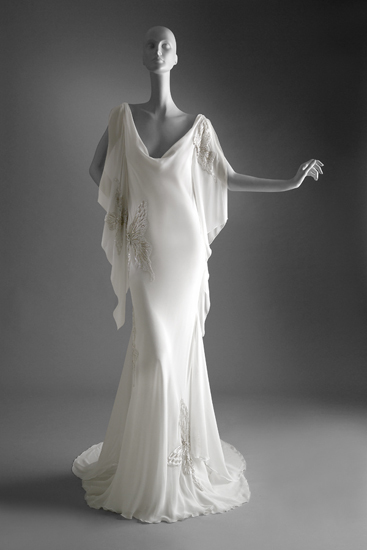 Drappeggio technique - Couture technique with chiffon and crepe silk draped on the bias. Tappeto di ruches technique - Couture technique of strips of tulle sewn to a base fabric to create a flat surface of tightly packed ruffles. Nervature technique - Couture technique with double seamed organza silk with line detailing. 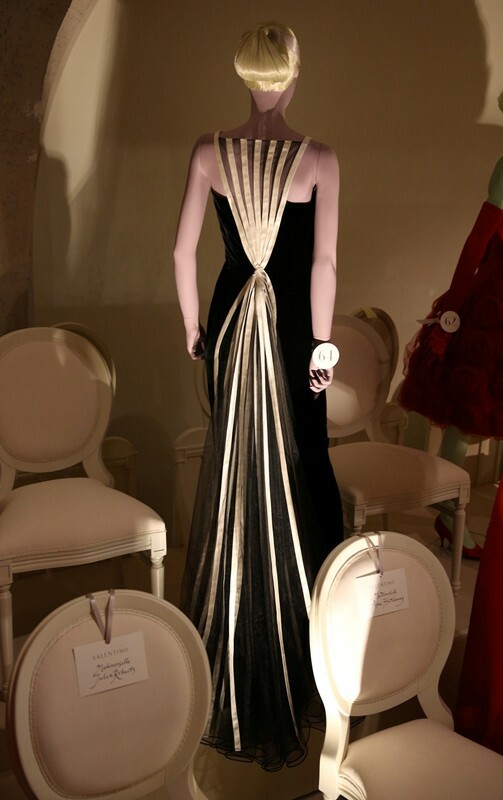 Budellini technique - Couture technique specific to Valentino where double charmeuse silk is rolled and sewn around a looped length of wool. Incrostazioni technique - Couture technique with sections of cut lace laid upon a tulle base. 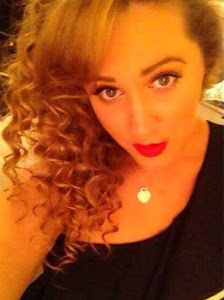 Volant technique - French word meaning flying, loose, floating. A floating pannel, a flounce. Volant a coni technique - Couture technique where lengths of organza silk are cut on the bias and laid vertically to form a volant. Rembourse technique - Couture technique where a circle of taffeta silk is fixed at the top and bottom to create volume. 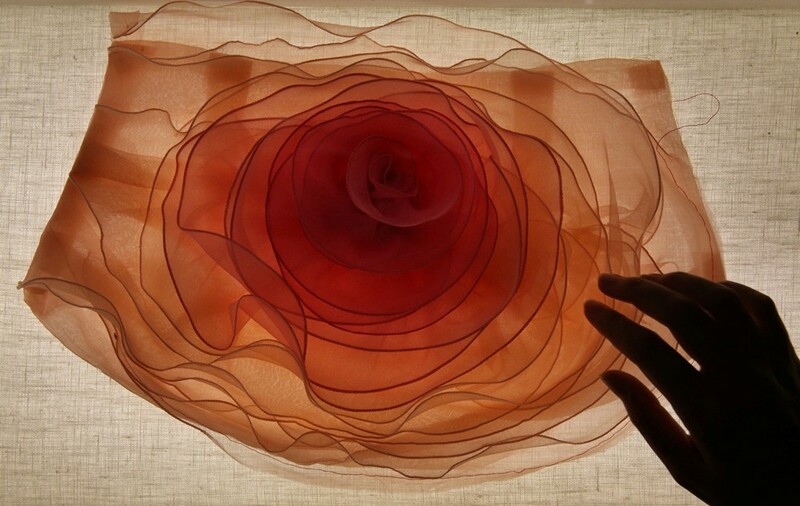 Rose di volant technique - Couture technique where lengths of organza silk are cut on the bias and shaped to form open roses. Firstly, this beautiful white silk dress, with swarovski butterflies on the side, trail and back of the dress. 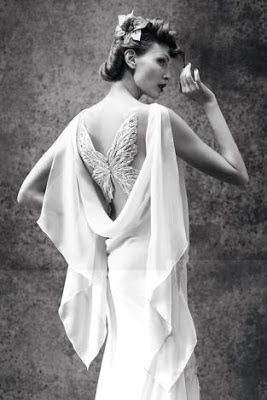 I loved this dress as it was so elegant and simple, and i love butterflies. 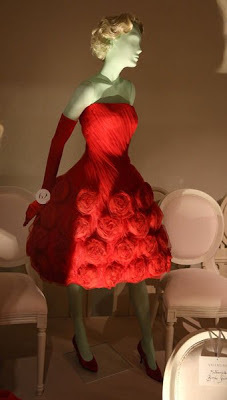 Secondly, this gorgeous signature Valentino red dress with organza rose detailing. 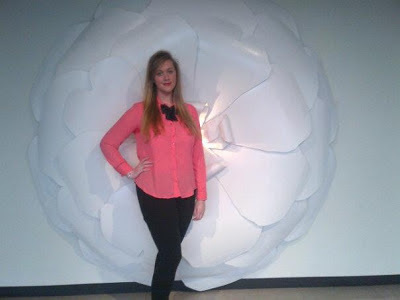 I loved this dress as i thought it looked really pretty and girly and i also loved the rose shape technique. And lastly, this diamond encrusted white dress. 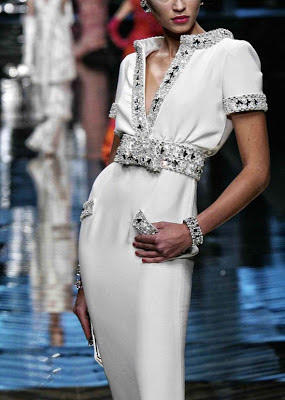 I love the use of the diamonds, but its not too over the top, its simply done just on the collar, cuffs, belt and pockets. 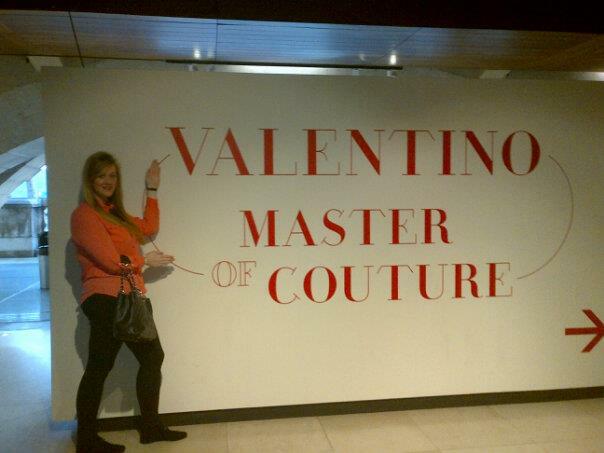 Overall, I had a fantastic time at this exhibition, it was the best exhibition i have ever been to and i highly recommend it to all fashion lovers! 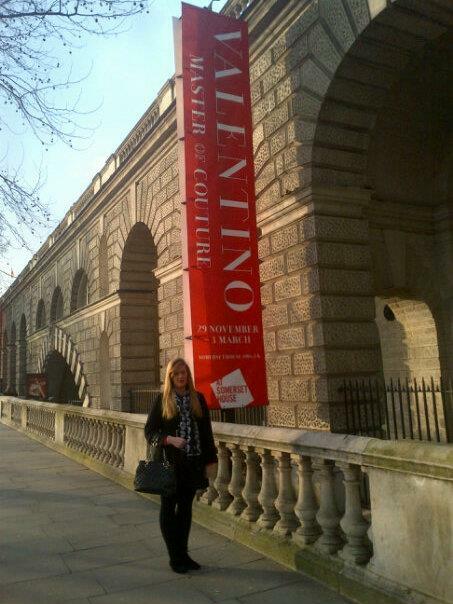 It's on at Somerset House till the 3rd of March 2013 and it's £12 for adults, £9 for students, but its SO worth it!